The Gimlet – purely medicinal of course! In the cocktail canon of gin there is both simplicity and variety. Drinks such as the Martini, Gin Tonic and the Negroni typically contain no more than three ingredients, yet they are popular drinks and receive the most attention in terms of variation. They are also the most controversial – do you shake or stir? Do you garnish with lemon, lime or both? Is an equal parts Negroni too simplistic? Another drink that fits into this camp is the Gimlet – a simple mix of gin and preserved lime juice (lime cordial) that has strong naval connections. Thanks to research by Scottish naval surgeon, James Lind, lemon and lime juice have been used since 1753 as a preventative against scurvy, a disease caused by a lack of Vitamin C. Scurvy causes easy bleeding, gum disease, joint pain and eventually death. The benefits of citrus were believed to be linked to the acidity in the fruit, but it was actually due to the presence of Vitamin C.
In 1793, lemon juice began to be issued by sailors in the Navy as standard. When war interrupted the source of lemons from Europe, the British began to use limes from the Caribbean instead. However, in the Queen’s Regulations for the Navy from 1862 there is no mention of lime, but it does refer to a ration of lemon juice and sugar. In fact, the regulations note that, should it be deemed by the captain and ship’s surgeon that extra spirits should be issued to engineers and stokers, it was mandatory that they be mixed with lemon juice and sugar. The citrus juice was originally preserved onboard with rum, but, in 1867, this changed. Lauchlin Rose, the founder of L Rose & Company, a firm supplying ships’ provisions in Leith, Scotland, invented a process that preserved citrus juice without alcohol; their product was a sweetened juice drink known as Rose’s Lime Cordial. 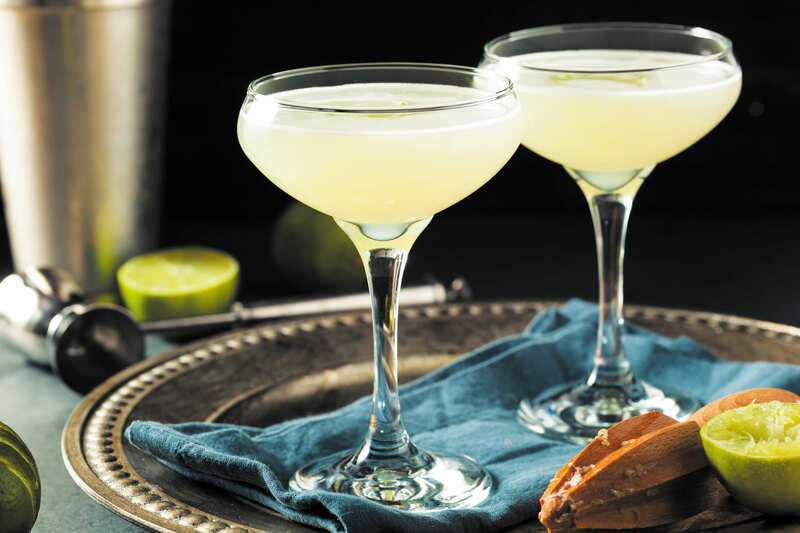 The earliest reference to a mix of gin, lime juice, water and sugar (the essential ingredients of the modern Gimlet) is first recorded in a paper on the treatment of cholera by Dr Surjo Kumar Chakraborty of the Indian medical service. The paper was published in Pamphlets on Biology: Kofoid Collection in 1852. Given that the drink was not known to the police in a city with such a strong naval presence suggests that its status as a current recreational drink was probably relatively recent. In the 1930 The Savoy Cocktail Book, the Gimlet is recorded as a 50:50 mix of ‘Burrough’s Plymouth Gin’ and ‘Rose’s Lime Juice Cordial’ that is stirred and, optionally, iced. There is also a recipe for a ‘Gimblet’, which is 3:1 mix of Dry Gin and Lime Juice, shaken, strained, and topped up with soda water. 2. Gimlette (Surgeon Rear-Admiral Sir Thomas Gimlette) – a naval surgeon who became Surgeon-General in the Royal Navy. Gimlette was born in 1857 and died on 4 October 1943 in Epsom. Whatever the exact origins, it seems likely that both connections helped to perpetuate the use and popularity of the drink and its name. As illustrated by the drink’s early history, the exact proportions of its ingredients have long been up for debate, but what impact does a different ratio make? This drink is not unpleasant, with hints of lime hard candy, but may be too sweet for some palates, although there is a nice tartness on the finish. This recipe works better with a gin with a higher ABV, such as a Navy strength gin with a greater botanical intensity. The still relatively high proportion of cordial to gin in this recipe adds more lime and sweetness, but also brings with it a sharper character with a hint of salinity – think lime-flavoured ice lollies. The lime notes linger more on the finish. Taken from Gary Regan’s Bartender’s Bible this ratio makes a particularly dry Gimlet with just a whiff of the lime juice on the finish. The fruit flavour is far more subtle, bringing the drink closer to the purity of a Martini. With any less lime cordial, I think it would be hard to recognise this drink as a Gimlet. For a more authentic feel (there was no ice for cocktails in the Georgian period), add the ingredients to a glass, stir and enjoy at room temperature. For a more modern, crisper version, shake with ice and fine strain into a cocktail glass. Inspired by the use of rum as a preservative for citrus juice in the Georgian period, this variation has prominent notes of gin and lime to start, followed by warm, mellow rum notes and a biscuity lime finish, reminiscent of key lime pie. Add ingredients to a tall, ice-filled glass. Stir gently and top-up with soda water. An early mention of adding soda to a Gimlet can apparently be found in DB Wesson’s I’ll Never Be Cured and I Don’t Much Care from 1928, although it has not been possible to verify this first-hand. Nevertheless, lengthening a Gimlet with soda water to make it similar in size and ABV to a Gin Tonic creates an exceptionally refreshing drink; using soda or sparkling water instead of tonic water avoids producing a drink that is too sweet. Add the gin and lime cordial to an ice-filled tumbler, add a swizzle stick, twist of lime and serve. Gimlets are often shaken and then served over ice, but the Gimlet-on-the-Rocks is instead built in a tumbler with ice, before being directly served with a straw or swizzle stick. This allows the drinker to mix it as they see fit. This makes for a more contemplative drink and the ice melt takes the edge off both the lime and the gin; a pleasant sipper for the late afternoon.